Have you ever cooked with seaweed?? I couldn’t even touch seaweed in the ocean for a long time as I hated the feel of it and now here I am eating it regularly!! Texture is a major deciding factor I find when it comes to food preferences. Raw seaweed is a bit rubbery, naturally tastes like the sea and can be very chewy. Dried seaweed still tastes of the sea but almost dissolves in your mouth. This minimises the issue with the texture of the fresh variety and opens up a whole host of food options. When cooking, my favourite type of seaweed is dillisk or dulse. I love the dried version and add it to my Oat & Seed Yoghurt Loaf, regular soda bread, fish pies and now in these scones. Savoury scones aren’t a major thing in Ireland. Scones are commonly eaten as a mid-morning or afternoon snack. Whilst travelling New Zealand, I discovered that savoury scones are everywhere with endless amounts of toppings. The most popular topping is cheese and these became my favourites! 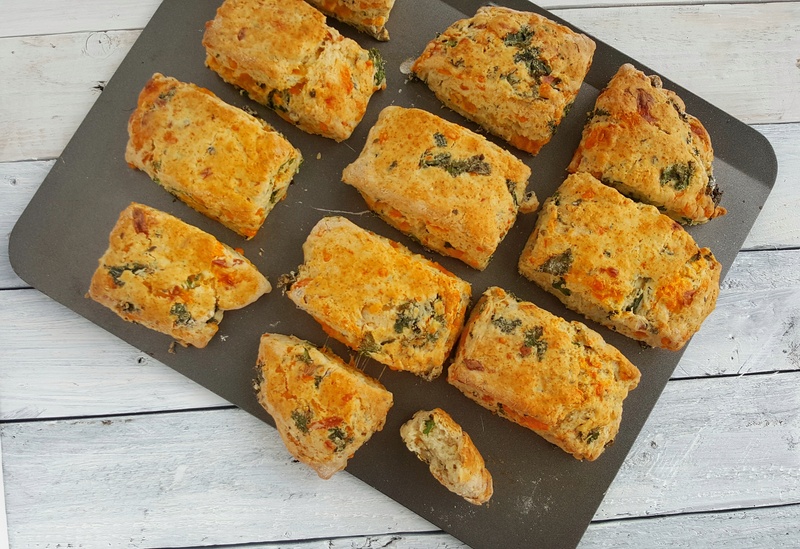 For this savoury scone recipe, I used a regular Irish red cheddar but you could use whatever hard or semi-soft cheese you have in your fridge. Feta and some chopped sundried tomatoes would work great alongside the kale and dillisk in this recipe too. Preheat an oven to 210C and grease a baking tray with butter or oil. Place the kale in a heatproof bowl, cover with boiling hot water and a pinch of salt. Allow to blanch for 2 minutes before straining and refreshing under running cold water until cool. Squeeze any excess water from the kale. Mix together all the dry ingredients in a large mixing bowl. Rub in the butter with your fingertips until the mix resembles breadcrumbs. Mix the milk and egg together. Make a well in the centre of the dry ingredients and pour in the egg mixture (save a little bit for brushing the scones with before baking). Stir together with a fork until well combined. Finally stir in the cheese and cooled kale until well combined in the scone mix. Flatten the scone mix onto a lightly floured surface forming a large rectangle. Cut into even scone shapes with a knife or scone cutter. Brush the top of each scone with the reserved egg mix. Bake in the oven for 12-15 minutes or until golden brown on top and baked through.